At 16 — with just $150 and “a bag of clothes” — Stephen Kempson left England for San Diego. His dream was to become a professional soccer player. It didn’t happen. But unlike many Brits who don’t become the next Beckham, Kempson had another talent to fall back on. As a lad, he’d worked for a small London haberdasher. On tea breaks he watched as tailors took fittings, then turned fabric into handsome suits. Kempson liked soccer. But he loved men’s style. When his sports career ended, Kempson worked on Rodeo Drive. Then came stints at Hickey Freeman, Dormeuil and Brioni. He learned about textiles, manufacturing and more. In 2001, he opened his own business in Los Angeles. It grew — but the real potential was in his New York clients. They dressed more formally than men in California. Soon, Kempson was traveling every other week to the East Coast. It did not take long for them to move. They’re raising 3 kids here, and love the community. For most of that time, Kempson commuted to his Park Avenue atelier. But a few months ago — as the train ride got longer, and his children got older — he thought about opening a pop-up shop here. Driving over the Post Road bridge in April, Kempson spotted a sign in the first storefront on Post Road West. George Subkoff Antiques was moving. The space was perfect. With a cutting table in the front, passersby could watch suits being made. Enormous windows on the side and in back offered superb views of the Saugatuck River and downtown. Stephen Kempson in his store. 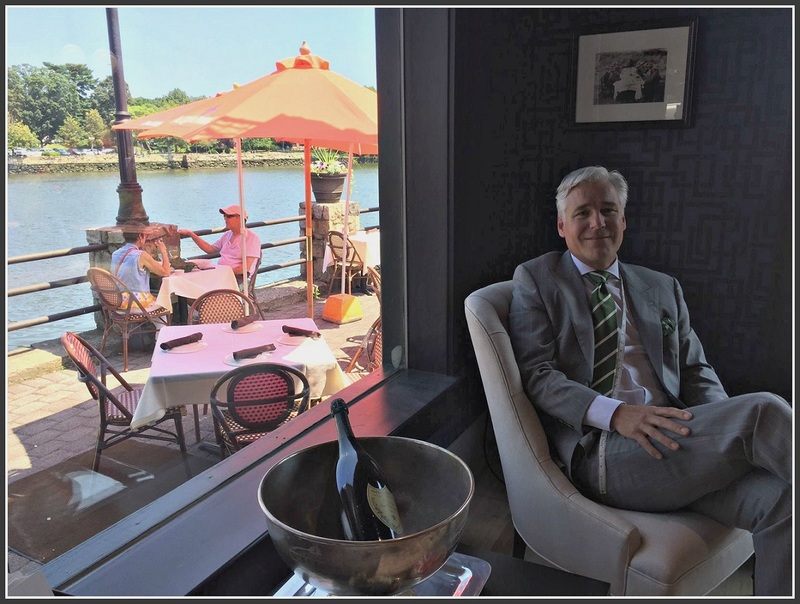 Behind him are diners on Arezzo’s patio, and the Saugatuck River. 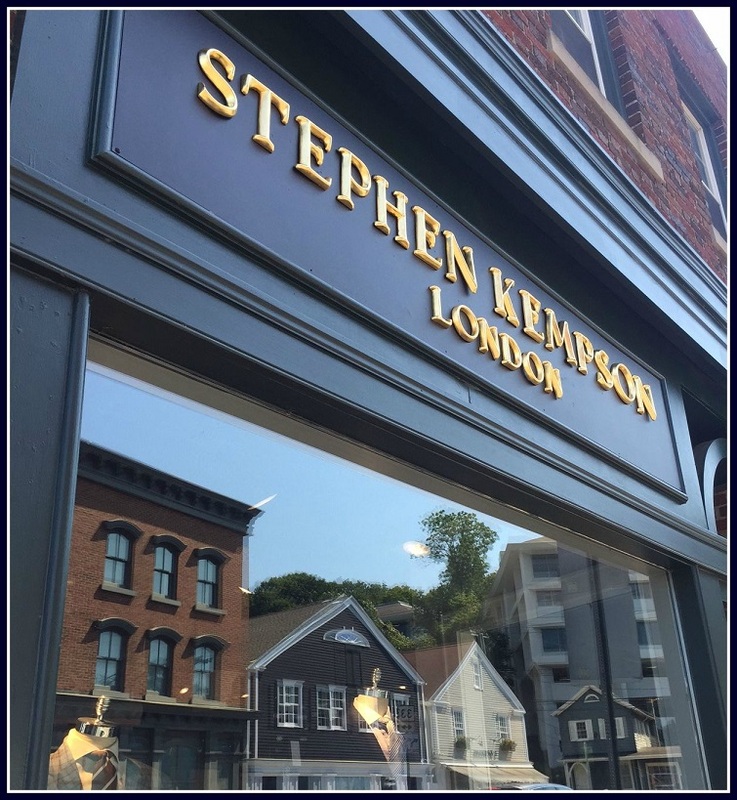 Stephen Kempson London opened just over a month ago. 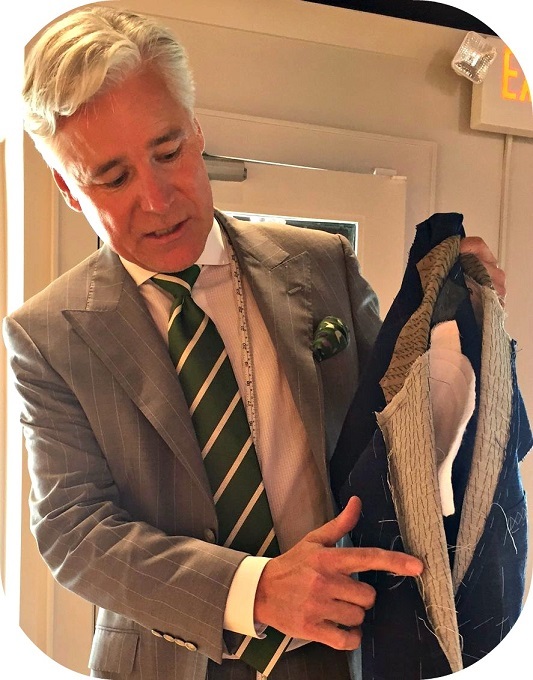 In addition to bespoke suits, jackets, pants and shirts, he offers shoes, ties and cufflinks; tailoring; ready-to-wear items off the rack, and wardrobe consultation. In fact, that personal touch is where Kempson truly excels. As we chatted the other day — with the river behind us, and a well-stocked bar in the corner — a customer walked in. He carried a $5,000 jacket. But it did not fit well — and the tailor in Milan had never met him. Kempson knows his customers — where they work, what they do, what makes them them. “I want people to put on my jacket, smile, and say ‘Wow! This is me! '” Kempson says. He tells the story of a Financial Times staffer who interviewed him in New York. At the end, the writer asked Kempson for a critique of his suit. Kempson told the truth: It did not fit him well. When the man handed over his business card, Kempson learned he was Lionel Barber — the FT’s New York managing editor. Kempson figured he’d blown the interview. But it turns out Barber’s colleagues had long despaired of his wardrobe. They encouraged him to get a full makeover. A few weeks later, Barber wore his new suit to an industry dinner. Colleagues marveled at how great he looked. One asked where he got his tie. Others wondered if he’d lost weight. “That’s why I do what I do,” Kempson says. Suits in the Stephen Kempson window — and reflections across Post Road West. And that’s why he is so happy to be doing it in his adopted hometown. He’s looking for a way to get more involved in the community — particularly for those in need. Eight years ago on a train to New York, he overheard a conversation with a down-and-out man. Touched, Kempson offered to pay for his monthly train ticket, so he could keep his job. The two are still in touch. “You have to give a hand up, rather than a handout,” Kempson explains. And then — near the end of our chat — this perfectly dressed, well-coiffed man says something stunning. “I was homeless once,” Kempson admits. Twenty years ago in L.A. — separated from his wife, with a 6-month-old child — he was living on the streets, showering at a pool. A friend of a friend gave him a place to live. Today, Kempson lives in Westport. He is elegant. His new store — also in Westport — is warm, welcoming and classic. But Stephen Kempson can make sure that your clothes make you. This entry was posted in Downtown, Local business, People, Sports and tagged bespoke tailor, Brioni, Stephen Kempson. Bookmark the permalink. kempson is awesome, his clothes are awesome, and he is just an incredible person, best of luck in the new spot! Our world needs many, many more people like Mr. Kempson. What a great and genuine story. All the best of luck in your new endeavors!